SUMMARY: Overachieving high school senior Hayley Westin doesn't have time for friends, parties, or social media. Ambitious and goal-minded, Hayley spends every waking hour studying for multiple AP classes, heading both the school newspaper and yearbook, and honing her debate team skills. So when Hayley discovers a fake Facebook page in her name, she believes someone close to her is out to sabotage her efforts toward a prestigious and competitive scholarship. But as the Facebook posts become increasingly personal, Hayley starts to panic. Who is out to get Hayley, and how far will he or she go to hurt her? REVIEW: About a year ago, I read another book by Anna Davies. In this book, I got annoyed very quickly with the author's constant use of the phrase "I'm fine" or "it's fine" or "everything's fine." It's not like I set out to notice these things, but once I notice them, they drive me nuts. As with Davies' other book Wrecked, I quickly noticed the same trend. 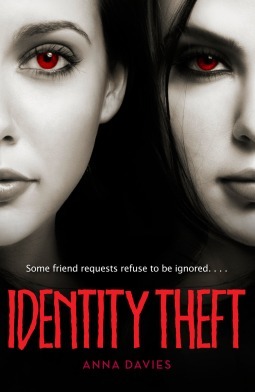 I read Identity Theft on my Nook, so I took a few minutes to search the word "fine" in this short novel. Would you believe "I'm fine" and similar "fine" phrases occur a whopping 79 times in this 256-page book? No wonder I noticed it so quickly! So why do I bring this up? So what if "fine" phrases make up a disproportionate amount of the dialogue? Well, to me, it points to poor writing and editing. If it's in there so many times that I notice it by about page 50, it's in there far too much. Instead of focusing on the story (which isn't really half bad), I am distracted by the frequency of one phrase. But is it a good book? I guess it's all right. Teens will probably like it far more than I did. I did not care for Hayley's character at all. She's unsympathetic and does more to alienate herself than anything anyone else does to her. She's whiny. Everyone is out to get her. She throws a tantrum when her mother--gasp!--orders something other than pizza in a restaurant. She doesn't realize how nasty she is when she passes over a great candidate for a yearbook editor based simply on the fact that she does not like her. Is that not what she complains everyone else does? Plenty of stereotypical characters round out the cast. There is the friendly nerd boy who is almost as ambitious as Hayley and, for some crazy reason, has a crush on her. The thoughtless but popular jock who Hayley likes (again, not sure why). And of course, plenty of mean girls, who post hateful Facebook comments and pass dirty looks at Hayley every time she walks by. Tons of social media and pop culture references will date this book quickly. For the time being, however, those references will draw some readers and help them relate to the story. While many young readers will love the "twist" in this one, I predicted it simply from reading the blurb. It's an okay twist, but I wish the summary hadn't been so obvious. Hayley and Adam (the nerd boy) go together to a scholarship question-and-answer session. The purpose of this session is for the scholarship committee to bring all the semi-finalists together and ask each of them one question to discuss on stage, in front of all the other candidates. Think the Miss America interview competition except with stupider questions, nearly all of which revolve around social media and/or pop culture. Anyway, so there are about a hundred "semi-finalists" in the room, all answering questions one-at-a-time on stage. After her question, Hayley leaves abruptly, climbs into a limo, wakes up at home, and owes the limo driver $100. Seriously, 100 semi-finalists? Was that everyone who applied? Last I heard, many scholarships go without applicants at all. I get that this one is a full-ride, but that still seems like a lot of "semi-finalists." This is a prestigious scholarship, so one would surmise that the semi-finalists are all uber-smart overachievers like Hayley and Adam. Yet one of the candidates, who prefers to be called "Willow," comes prepared to sing the committee a song. She then proceeds to give the stupidest possible answer to her question and come off as a complete ditz. Huh? This is one of the semi-finalists? Where did the limo come from? Was it just there, waiting for someone to come out and need a ride home? Did she flag it down? If she "climbed in and fell into a dreamless sleep, not waking until we reached my house," then how did the limo driver know where to take her? Limo rate for a one-hour drive home from Concord=$100. I haven't taken too many limo rides in my life, but this is about what it would cost to take a cab that distance. What a bargain for a limo! I know it seems like I am being too hard on this book, but the devil is in the details. These are but minor details, really, ones that probably won't affect the overall story for many readers. But they're still there. Where was the editor? Why did no one notice these (and several other) problems in logic? They would be easy enough to fix if someone bothered to do more than a cursory read. In today's saturated YA market, I would think authors, editors, and publishers would do absolutely everything they can to make their books as flawless as possible. That this book got published with this many flaws should give budding writers hope that they, too, will one day get published. THE BOTTOM LINE: The story itself reminds me of those deliciously cheesy horror novels from the 80s. It does, however, have many flaws in logic, unlikeable characters, and repetitive phrasing. STATUS IN MY LIBRARY: It's not out yet, but I am donating my copy (not an ARC) to our library. My students will like it even though I don't. I don't think they'll notice all the problems I do.